In 1957, just four years after Stalin's death, Moscow hosted a huge festival where thousands of foreign students could meet and exchange ideas with Russian locals. In 1957, just four years after Stalin's death, 30,000 students from 130 countries attended the 6th International Youth Festival in Moscow, a two week celebration of 'Peace and Freedom' with music, dance, theatre and sports. British student Kitty Hunter-Blair remembers a unique moment for young Russians, who were allowed, for the first time, to talk freely to foreigners. 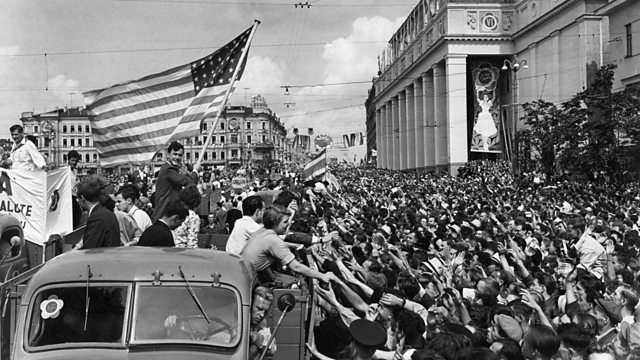 Picture: Participants in the 6th International Youth Festival in Mayakovsky Square, on their way to Lenin stadium for the opening ceremony, July 28, 1957. Credit: Sovfoto/UIG via Getty Images.